Our manual MicroBlasting system features our latest edition of the Comco MicroBlaster and our most popular workstation. This system is ideal for many reasons, but best of all, it provides a turnkey solution that suits most applications. All AccuFlo and ProCenter Plus models are CE and RoHS compliant. Simoom® Technology, our patented method of mixing air and abrasive, provides greater control, increased power, and wider versatility in this updated edition of our classic MicroBlaster®. In fact, this MicroBlaster is so powerful and precise, we had to give it a new name to reflect its capabilities. 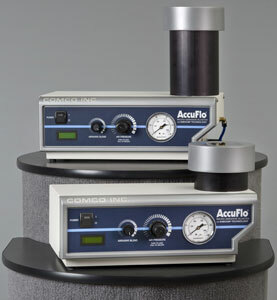 The AccuFlo® produces a steady flow of abrasive which ensures consistent results. 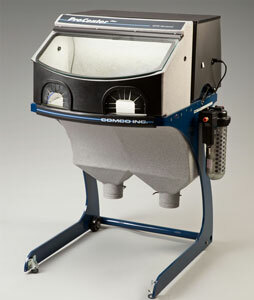 It processes parts faster than most traditional micro-abrasive blasters, and it does so with greater powder efficiency. The AccuFlo is able to handle a wide-range of abrasives and suits most MicroBlasting applications. The ProCenter Plus™ is our cleanest, quietest and most comfortable blasting center. It combines a spacious, well-lit work chamber, air dryer and dust collector in one freestanding unit. Ergonomically designed for operator comfort, this unit is compact, mobile and convenient for any workplace. The ProCenter Plus comes equipped with HEPA filtration and can be adapted to handle static sensitive applications. Easily check powder level through AccuFlo’s clear tank cover; refill quickly with only a 3/4 turn. Get a more consistent uninterrupted flow thanks to the AccuFlo’s PowderGate® valve—more responsive than the traditional pinch. Reduce downtime for refills—the abrasive tank holds 50% more media. ProCenter’s ergonomic design reduces operator fatigue. The AccuFlo’s ComfortGrip® Handpiece grants operator greater dexterity and comfort. The ProCenter features minimized air discharge and integrated silencer for quiet operation. Its large work chamber features a hinged window for easy parts handling. All wear parts are easily accessible in the open design. Air lines and connectors are color-coded for easy identification. Easy-to-read LCD counters track blast cycles and hours of use, providing simple milestones for maintenance. Uses HEPA filtration to ensure that 99.97% of all particles greater than 0.3 µm are removed. Quickly knock off spent abrasive using attached filter mallets. Accessible hopper for convenient powder removal. MicroBlaster or AccuFlo- How Do You Choose? The ComfortGrip Handpiece – It Makes a Difference! Comco Videos- See the Manual System in Use!